It seems Rob Manfred is a bit of a control freak. We already know about the commissioner of Major League Baseball’s mandate that the league gets its slice of the sports betting pie by way of integrity fees. 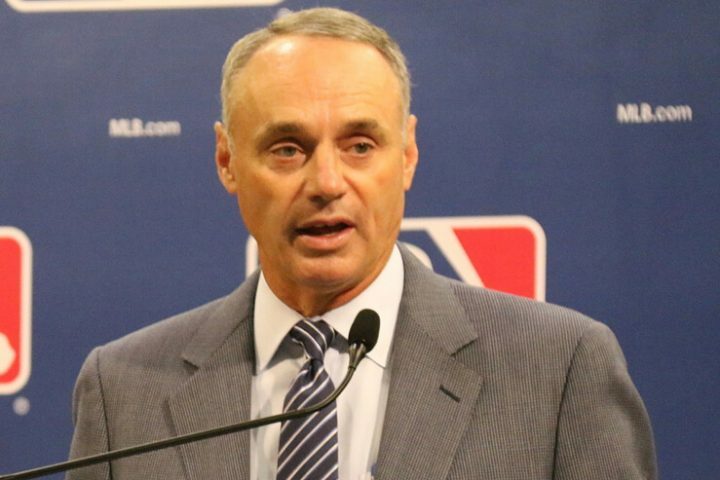 The greed and desperation became obvious when Manfred prohibited MLB teams from accepting advertising money from sports betting operators. More recently, during an appearance on The Dan Patrick Show in D.C. over the All-Star break, we found out what Commissioner Manfred wants the most: control. That Manfred wants to have a say in federal regulations for betting on baseball makes some sense. But it’s something else Manfred said that leads me to believe he wants to dictate the process rather than just “have a say.” Manfred actually went on record about wishing he could control how Mike Trout, the best player in baseball today, spends his free time. Apparently, in the eyes of the commissioner of baseball, Mike Trout doesn’t spend enough of his time and energy marketing the game of baseball, which is one of Manfred’s stated reasons for the dip in league attendance. I’m sorry, but in my eyes, once you start telling people what they should do with their time, not to mention blaming them for your problems, you’re pushing your agenda on them. Sadly, it appears this is how Manfred intends to handle the legal sports betting industry, too. We know, you know — you don’t even need research, but there is research — fan engagement can be improved through gaming. People are more interested in the sport, they consume more of the sport. With all due respect, I don’t understand what, exactly, Manfred and MLB are going to do to “protect the integrity” of baseball that isn’t already being done by every other legal betting market in the world. Of course, a large part of the reason I don’t understand is because they aren’t saying how they’re going to protect the game’s integrity, which is likely because they can’t do anything else to achieve that end. It is undeniably in the best interest of sports betting operators, and thus the states, to maintain the integrity of the sports for which they offer betting lines. The fact that Manfred won’t acknowledge that or doesn’t realize it is evidence of one thing: It isn’t what he cares about. He cares about money and control. The MLB is saying, “Look, this is our game, and we want to improve certain aspects or elements of the gambling system so that we’re comfortable with it. And to do that we’re going to incur costs and we’d like to be paid for that.” There may be some merit to what they’re trying to do. The teams aren’t really starting to backlash against the commissioner right now. It’s my understanding the MLB is currently developing regulations. The teams are content to see what’s actually served up. If the regulations aren’t what the teams find to their liking there will be some pushback, but I think right now it’s just premature because you don’t have that yet. Etna is right about one thing: It’s all speculation at this point. Maybe the teams have reason to believe the “regulations” won’t be restrictive to them in any way, and are just waiting for the league to do its due diligence. From their perspective, it makes sense to wait to see if there’s anything to complain about before complaining. Or perhaps Manfred really is a control freak, and he’s made it clear there will be repercussions for anybody who speaks out against the office of the commissioner. I tend to believe the latter is closer to the truth, because no matter what happens, I don’t see this story getting a fairytale ending. It’s a shame, because if all parties just did what they were supposed to do, everybody would prosper. It’s pretty simple. The states (or the country as a whole) handle the regulations. The league works on improving its on-field product. The operators work on creating the best mobile sports betting apps they can. And fans and gamblers place their bets and come to the park more often or watch more games on TV. It could’ve been a win for everybody, but instead, it looks like Manfred needs to be the biggest winner, and he doesn’t care if it’s at the expense of everybody else.